Daniel Kusner thinks he’d make an absurd-looking woman, and he feels bad for anyone in heels and eyeliner. Kusner knows a thing or two about fashion and iconography, though. That, and about 1,000 other gender-relevant subjects he relays with giddy and contagious interest, from French philosopher Charles Fourier’s take on “fairies” (this affected Dallas history) to the first man who outsold women in the Mary Kay makeup empire (this did, too). “214 Trans4m,” Kusner and housemate Bryan Amann’s photography exhibit at the Kessler Theater, uses transgender models to depict women who’ve shaped Dallas culture. And one photo shoot has already drawn spit — yes, actual projected saliva — from an elementary-school class. Kusner and Amann were at the John F. Kennedy Memorial Plaza downtown while a drag artist named Richard D. Curtin reclined in dramatic repose upon a slab bearing JFK’s name. In character as Edith Bouvier Beale — remember Little Edie from "Grey Gardens?" — Curtin also danced near Kennedy’s symbolic tomb. “And they spit on us,” said Kusner, laughing a little. When they work together, Amann mans the lens as Kusner stages the scene — talent, set, hair, and wardrobe — to suggest iconic moments in history. There’s Jackie Kennedy at The Dallas Morning News building, looking stoic as copies of a famously critical full-page ad (“Welcome Mr. Kennedy to Dallas”) flutter by. She’d be widowed by that afternoon. There’s Tina Turner fleeing Ike. There’s opera diva Maria Callas the day she gave her knockout 1957 performance at Fair Park, and Mary Kay Ash at her namesake museum, holding a pink pyramid. Curator Nicole Cullum Horn especially likes the latter shot, called "Pretty Powerful." 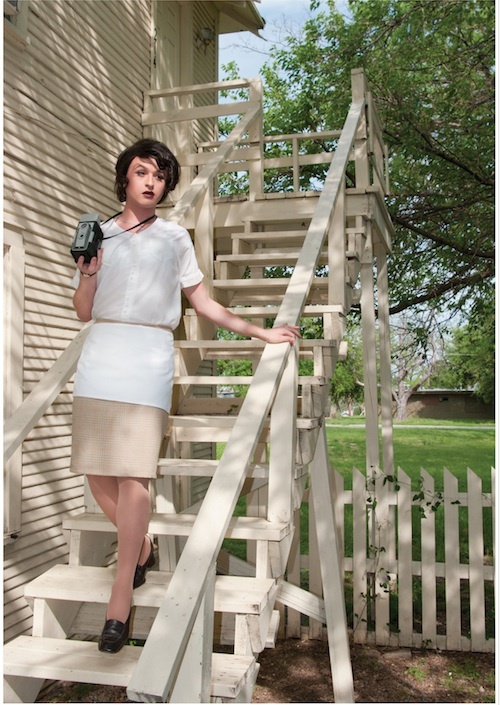 Then there’s the most recent piece: Model Frankyee Popovich as Lee Harvey Oswald’s battered wife, Marina, the day she photographed him with guns and Socialist papers. "The Sniper’s Love Nest" was shot on location at the family’s old Neely Street apartment, and every detail was planned down to the model’s conservative watch. Popovich poses with a camera — the same kind Mrs. Oswald used. But someone has disputed its accuracy: Oswald herself. Amann, whose background is in furniture design, got to know Oswald years ago when she worked for a foam supplier. Oswald declined to come to the show, Amann said, for fear she’d give other patrons the wrong idea. A former journalist, Kusner has penned heartfelt statements to accompany many of the “214 Trans4m” photos. For more than a decade, he was a Dallas Voice editor, often recruiting Amann for photos. He even published his own culture magazine, Spread — interviewing the likes of the Beastie Boys, Roe v. Wade attorney Sarah Weddington, and a leader from Westboro Baptist Church (of “God Hates Fags” fame). He found her fascinating. Incidentally, Kusner found Texas A&M, where he started college in the late ’80s, to be “the most exotic place on earth,” and also the friendliest.